AEP retirees (from left) Ronald McCrea, Dale Krummen, Mike Martin, Larry Hutchison and Thomas Beck. AEP active and retired employees have helped 17 families build their own new homes in central Ohio since 1996, and it’s time to do it again. 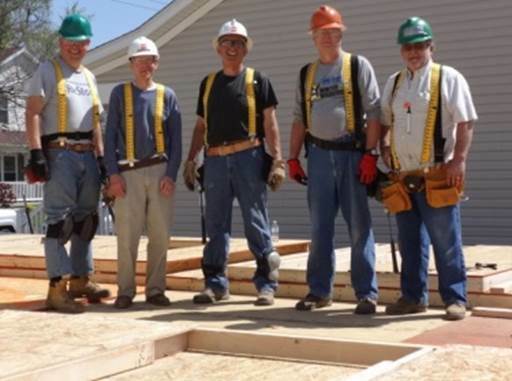 Through the years, AEP volunteers including retirees working alongside members of the families who would occupy the new homes have helped build houses in Columbus neighborhoods, including North and South Linden, Franklinton, the Hilltop, Milo-Grogan, Weinland Park and the South Side. That’s 17 families and dozens of people who are living in safe, decent and affordable homes. And seven communities that are improved through the addition of new homeowners committed to the neighborhood. Now, active and retired employees are helping the Sanya and Andre Millsop family build a three-bedroom, two-bath home at 97 E. Woodrow Ave. on Columbus’ South Side. The Millsops, who have met income and other eligibility criteria, will provide up to 250 hours of sweat equity to take ownership once the build in completed sometime in October. “A team of AEP retirees works on the home each Wednesday from 8 a.m. to 3:30 p.m.,” said retiree crew leader Dale Krummen, who has been assisting AEP community champ Jim Rosing on local AEP home builds since 2011. “This effort supplements the progress of active AEP employees, who work on site each Saturday from 8 a.m. to 2 p.m.,” Krummen said. While full day commitments are encouraged, they are not necessary. Retirees are welcome to join with active employees to assist with the home build on Saturdays as well, he added. Rosing said AEP retirees in addition to Krummen who regularly join the Wednesday crew include Ronald McCrea, Mike Martin, Larry Hutchison, Thomas Beck, Butch O’Brien, Ernie Pfund and Jim Michalec. Krummen and Rosing agreed they would like to see other retirees join the effort and rekindle old friendships or start new ones. Materials, tools and job-specific training are provided on-site, where the day begins with a safety briefing, Krummen noted. To volunteer for the Wednesday retiree crew, contact Krummen at 614-440-3042, dakrummen@yahoo.com. Questions and inquiries are welcome. For information on joining Saturday work dates, contact Rosing at 614-716-6856, jrrosing@aep.com.